An accomplished composer, conductor and lecturer, Eric Whitacre has quickly become one of the most popular and performed composers of his generation. The Los Angeles Times has praised his compositions as "works of unearthly beauty and imagination, [with] electric, chilling harmonies," while The Philadelphia Inquirer has called him "the hottest thing in choral music"
Many of Whitacre's works have entered the standard choral and symphonic repertories and have become the subject of several recent scholarly works and doctoral dissertations. His works Water Night, Cloudburst, Sleep, Lux Aurumque and A Boy and a Girl are among the most popular choral works of the last decade, and his Ghost Train, Godzilla Eats Las Vegas, and October have achieved equal success in the symphonic wind community. To date, Whitacre's published works have received thousands of performances and sold well over 350,000 copies worldwide. 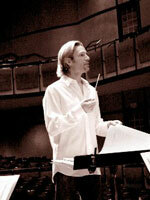 As a conductor, Mr. Whitacre has appeared with hundreds of professional and educational ensembles throughout the world. In the last ten years he has conducted concerts of his choral and symphonic music in Japan, Australia, China, Singapore and much of Europe, as well as dozens of American universities and colleges where he regularly conducts seminars and lectures with young musicians. Most recently, Whitacre has received acclaim for PARADISE LOST, a cutting edge musical combining trance, ambient and techno electronica with choral, cinematic, and operatic traditions. Winner of the ASCAP Harold Arlen award, this musical also gained Whitacre the prestigious Richard Rodgers Award for most promising musical theater composer. Whitacre has received composition awards from the Barlow International Composition Competition, the American Choral Directors Association and the American Composers Forum. His first recording, "The Music of Eric Whitacre," was hailed by The American Record Guide as one of the top ten classical albums of 1997. In 2001, he became the youngest recipient ever awarded the coveted Raymond C. Brock commission by the American Choral Directors Association. Mr. Whitacre lives in Los Angeles with his wife, celebrated soprano Hila Plitmann and their son.